It’s not something I’ve ever hidden since I first set my eyes on him in my teens. I’ve had this MAJOR crush on Jeff Koinange and my family has always indulged me by saying that maybe one day I will meet Jeff and let him know about this crush of mine. I have met Jeff quite a few times but I also know he has met so many people in his lifetime that he wouldn’t ever remember me. I also don’t think he remembers signing an autograph for me on a serviette which my Mum threw out thinking it was rubbish. I remember the silent treatment I gave her lasted more than a week. How could she?! Anyway, as years passed all I could do was follow Jeff’s progress on TV and then the Internet made it virtually possible for me to catch up with him online. Then this wonderful phenomenon called Twitter suddenly became all the rage and I bumped into Jeff there. I made no secret to him of what a pin up guy I thought he was. 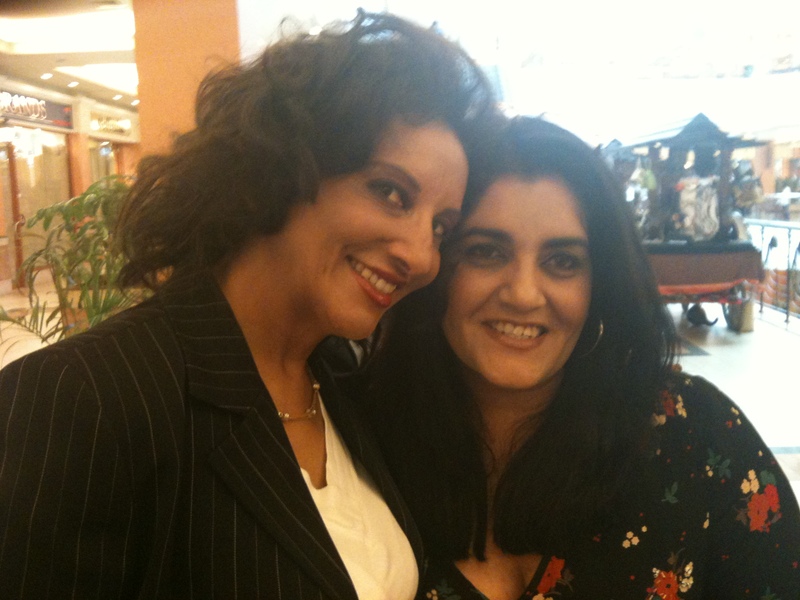 So much so that PR Guru Gina Din noticed me swooning over him and told me to get a grip on life. It was hilarious. Gina has known Jeff personally for years and promised to set up a meeting so I could meet this idol of mine. Bob Collymore, CEO of Safaricom, jumped right in and virtually rolled his eyes at the banter on Twitter. In all this Jeff and Bob gifted me fancy chocolates and I know this happened all thanks to Gina who did everything to make me feel so awesome! It was amazing. I was like an awestruck teenager getting fan mail from my favourite hero. So last week, after months of planning this, after months of finding an empty slot in Jeff’s very busy schedule, a coffee date was finally fixed. Gina was seriously lovely about it and offered to chaperone, which had me in giggles. This was going to be my first-ever chaperoned date and I was really looking forward to it. The day dawned & Twitter was abuzz about this impending date at 10am at ArtCaffe and I was really nervous. 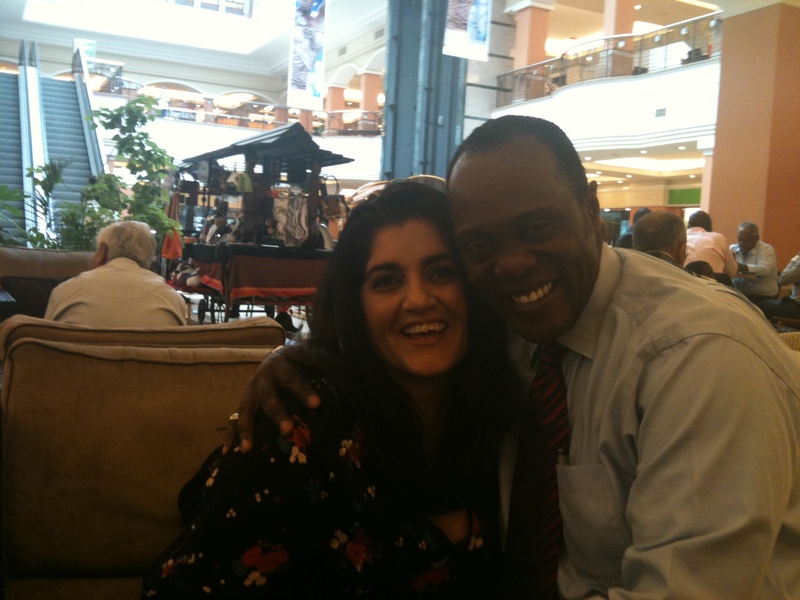 Not because of the date aspect of it all – I guess that was all part of the fun we were having- but from the fact that I was going to meet THE Jeff Koinange who still has the ability to have me weak-kneed. Gina and Jeff were already at the café and I met with them. The perfect gentleman that I had always known him to be, Jeff stood up and gave me a huge hug and presented me with flowers and I nearly passed out while Gina stood there with an extremely amused grin observing the exchange of greetings. Jeff and Gina’s larger than life personalities garnered more than admiring glances from other patrons of the café and so many people stopped by to greet them both. I was truly in the company of celebrities! I know that many won’t think this to be a big deal but if you’re in my place you know what a big deal it is because I never in my life dreamt that I would ever be deemed as a friend by the likes of Jeff, Gina and Bob who give me so much respect and I’m proud to call friends. Anytime I have expressed any kind of personal problem, Gina is the first to communicate to remind me she’s just a phone call away if I should need any kind of help. It means a lot to me that someone of her stature doesn’t think twice about anything and is there genuinely. So that’s the big deal on my date with Jeff as chaperoned by Gina. I will always and forever swoon over Jeff. He’s my teen heartthrob and my daughter also thinks he is awesome after having met him at her school and has his autograph framed and hung by her bedside. Jeff truly is a hero…!